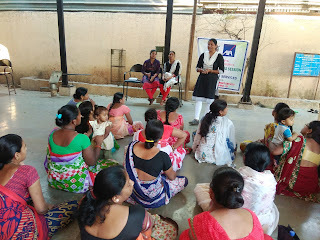 18-March-2019, Chinchwad (Pune): The Don Bosco Development Society (DBDS), Chinchwad organized a health awareness session for the Self-Help Group women residing in Mahatma Phule Nagar slum. 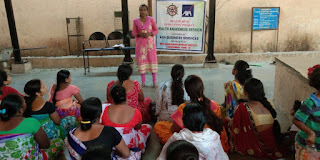 20 women participated in the session held under the aegis of ‘Health Risk Reduction Project’ supported AXA Business Services. Mrs. Rajshree Deshkkhire, Ms. Sarika Kadam and Mrs. Vibhawari Kamble (all 3 DBDS – Staff) were the resource persons for this session. 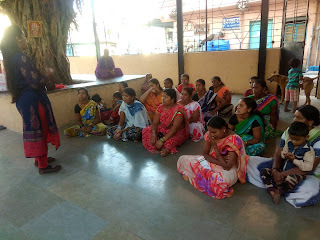 In her address Mrs. Rajshree gave information on importance of personal health and hygiene. 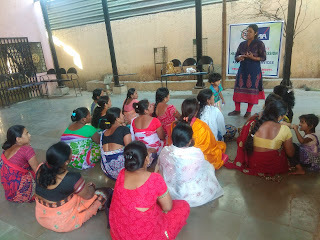 Ms. Sarika focused on healthy nutrition, habits and environment for women. 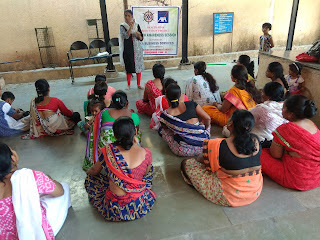 Mrs. Vibhawari informed women on the harmful effects of tobacco and cause of Cancer and covered various topics such as composition of tobacco, forms of tobacco, harmful effects on body and mind, oral cancer, lung cancer and many more health problems associated with such habit. Mrs. Sarika did the logistical arrangement for this session and organized women to participate in this session. After the session snacks were served to all.